Why has the ethnographic museum run out of steam? – Wie weiter mit Humboldts Erbe? At various points over the last few months, I have been reminded of the notion of an artificially maintained (scientific) controversy. Most, if not all, readers are aware of the Trump administration’s attitude towards climate change, while the United States has been investing billions in research over decades that has produced overwhelming evidence for the impact of human action on global warming. The controversy should be over, and the debate should focus on ‘how on earth’ to face the inevitable consequences. Yet, nearly fifteen years after Latour’s words were published, “dangerous extremists are [still] using the very same argument of social construction to destroy hard-won evidence that could save our lives.” It seems that in a manner of “instant revisionism,”[ii] rigorously generated insights can be overturned and controversies prolonged for the sake of ideological posturing and political bickering. Whatever efforts of such denial continue to be made, however, global warming certainly will not be tamed by ideological hiding but remain a reality to be reckoned with. It might be a far stretch for the reader, but this sense of an artificially maintained controversy is also what comes to my mind when following the current debates, or rather conflicts, around ethnographic museums, especially in Germany. Promising concepts and terms such as ‘multiperspectivity’, ‘shared heritage’ and ‘source communities’ circulate in nearly each museum-related document, grant application, conference program, professional publication, policy statement and press release. Yet, does their critical potential really lead to epistemic, political and structural reconfigurations? Or can they rather be unmasked as insidious acts of what Friedrich von Bose calls “strategic reflexivity,” that is, the co-opting of (post)colonial critique for the sake of stabilizing the (neo)colonial status quo? [iii] What has become of the “museum spirit”, to slightly amend Latour’s “critical spirit”,[iv] when this institution tends to oscillate between “colonial aphasia,”[v] or silencing, and an overemphasis on peaceful and legal acquisitions and transactions, which by and large were (and are) still manifestations of an underlying violent and unethical “situation coloniale”? [vi] The recently posed question (framed from within the Humboldt Forum in possessive terms! ),“Wem gehört die Kunst der Kolonialzeit?”,[vii] could thus only be answered with “Runter vom Ross, Herr Parzinger!”[viii] by (post)colonial critics calling for the restitution of human remains and colonial loot from outside the Humboldt Forum and across a seemingly unbridgeable divide. Is this really the current state of the debate or controversy? To be sure, once again, (post)colonial realities certainly will not be disguised by artificially maintaining their denial.Has the ethnographic museum, an institution initially founded to tackle big ideas and questions – however suspicious or even perverse some of them appear to us today – “run out of steam”, to borrow Latour’s words once again? In a talk given at LMU Munich, in late 2016, the same Latour laid out the trajectory “from the anthropocene to the new climatic regime”. While doing so, he took issue with the concepts of the globe and globalization, and argued that humanity needs to rethink the Earth as a living system, or “Gaia”, assuming center stage rather than being relegated to the background as “Nature”. To achieve this, Latour further argued, knowledge needs to be harvested from across the disciplines. When probed about a concrete pathway, he referred to the cosmologies once collected and stored in archival and museum collections, in the name of anthropology, to salvage a past doomed to disappear. This treasure trove, Latour suggested, should be revisited to reimagine humanity’s multiple potential futures. These are the big questions and ideas of the 21st century to be tackled by ethnographic museums. For this to be made possible, however, these institutions urgently need epistemic assistance. So-called ethnographic objects in European museums remain largely alienated from the distant cultural environments of their Indigenous producers and sources of knowledge. The core of the widely observable conflicts between European institutions and Indigenous people is therefore even deeper, and, apart from the (largely-justified) claims for moral redress, political concessions and legal reparations that tend to dominate museological debates—as witnessed once again in the latest round of the seemingly never-ending battle sparring Humboldt Forum and No Humboldt 21!—I see the problem as essentially epistemic and methodological. That is, the desperate grip on Deutungsmacht, for example, which continues to paralyze anthropological and museological discussions, is often not only politically and morally reprehensible but methodologically flawed. In other words, the debate and controversy needs to move from the (important) political and ethical implications to the underlying (and even more important) Indigenous ways of knowing and being through which political and ethical issues may arise, and through which humanity’s multiple potential futures can be reimagined. [ix] What happens, then, when archival and museum collections are used in the present and mobilized towards the future? And what happens if we approach museums, not only as mechanisms and structures of collecting, ordering and governing, but also as dynamic-contingent processes, heterotopian spaces, and living resources for creative interventions and utopian (re)imaginations? Figure 1. The seal of the Board of Maori Ethnological Research, Wellington, showing an ocean going waka (canoe) under sail. This seal was used on all Board correspondence from it’s establishment in 1923. Courtesy author. For an explanation of the image, see: A. T. Ngata, ‘He ‘Whakamarama/Preface,’ in Nga Moteatea: He MaramaraRere No Nga Waka Maha. He Mea Kohikohi Na A.T. Ngata/The Songs: Scattered Pieces from Many Canoe Areas Collected by A.T. Ngata. Part I. edited by A.T. Ngata, translated by Pei TeHurinui Jones (Wellington: The Polynesian Society 1959/1928), p. xiv. Philipp Schorch is Head of Research, State Ethnographic Collections Saxony, Germany, and Honorary Fellow at the Alfred Deakin Institute for Citizenship and Globalisation, Deakin University, Australia. Philipp is co-editor of Transpacific Americas: Encounters and Engagements between the Americas and the South Pacific (Routledge, 2016) and Curatopia: Museums and the Future of Curatorship (Manchester University Press, 2018). [iii] Friedrich von Bose (2017). Strategische Reflexivität: Das Berliner Humboldt Forum und die postkoloniale Kritik. Historische Anthropologie 25 (3): 409-417. [v] Stoler, Ann Laura (2016). Duress: Imperial Durabilities in our Time. Durham: Duke University Press. [vi] Habermas, Rebekka (2017). Benin Bronzen im Kaiserreich – oder warum koloniale Objekte so viel Ärger machen. Historische Anthropologie 25 (3): 327-352. [vii] Parzinger, Hermann (2018). Wem gehört die Kunst der Kolonialzeit? Frankfurter Allgemeine Zeitung, 25.01.2018: 8. [ix] Schorch, Philipp, McCarthy, Conal & Hakiwai, Arapata (2016). Globalizing Māori museology: Reconceptualizing engagement, knowledge and virtuality through mana taonga. Museum Anthropology, 39 (1), 48-69; Schorch, Philipp & Kahanu, Noelle M.K.Y. (2015). Forum as laboratory: The cross-cultural infrastructure of ethnographic knowledge and material potentialities. InPrinzip Labor: Museumsexperimente im Humboldt Lab Dahlem (pp.241-248). Berlin: Nicolai. [x] Hooper-Greenhill, Eileen (2000). Museums and the Interpretation of Visual Culture. London & New York: Routledge, 153. [xi] Examples include the national museum (Museum of New Zealand / Te Papa Tongarewa), armed forces museums (National Museum of the Royal New Zealand Navy / Te Waka Huia o teTaua Moana o Aotearoa), and regional museums (Golden Bay Museum / Te Waka Huia o Mohua). See also www.nzmuseums.co.nz/. Accessed 15 March 2017. 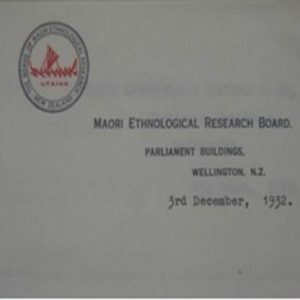 [xii] See: T. R. Balneavis, ‘TePoari Whakapapa: Board of Maori Ethnological Research’, Te Toa Takatini(1 September 1924), p. 101. See also: A. Ngata, ‘He whakamarama / Preface’, in A. Ngata (ed), Nga moteatea: He maramararere no nga waka maha. He mea kohikohina A.T. Ngata / The songs: Scattered pieces from many canoe areas collected by A.T. Ngata. Part I, trans. Pei Te H. Jones (Wellington: The Polynesian Society, 1959/1928), p. xiv. [xiii] M. Foucault, ‘Of other spaces, heterotopias’, Architecture, Mouvement, Continuité, 5 (1984), 46-49. [xiv] Schorch, Philipp, McCarthy, Conal & Dürr, Eveline (Forthcoming). Introduction: ConceptualisingCuratopia. In P.Schorch & C. McCarthy (Eds.). Curatopia: Museums and the Future of Curatorship. Manchester: Manchester University Press.